Kelly has an open and approachable style and a nonjudgmental, calm and compassionate manner. Her personal journey with yoga led her to explore ways to integrate the practice with clinical work. She discovered that consciously combining yoga in all its elements with psychotherapy can complement and enhance the effectiveness of each. 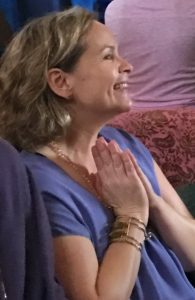 Her integration of the practices occurs in her Yoga and Talk® Groups, in individual sessions with group members, and for individuals seeking yoga therapy as an adjunct to traditional psychotherapy. Her clinical background is with children, adolescents, and adults providing individual therapy, groups, and family therapy since 1995. She has a long history of helping people heal trauma, anxiety, and depression as well as with immigrants and refugees. She is Level 2 certified in EMDR and is bilingual in Spanish. She received an MSSW from the University of Texas at Austin and a BA from Tufts University. 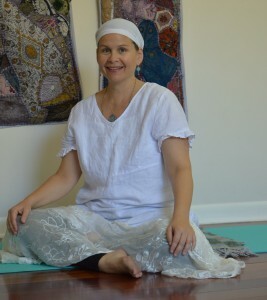 Kelly studies and teaches kundalini yoga as taught by Yogi Bhajan. She began her study of yoga 25 years ago and is certified as a yoga teacher at the highest level (500 hours). She continues to actively study with senior teachers throughout the country. She is a certified yoga therapist through the International Association of Yoga Therapists. She provides workshops privately and at organizations such as Austin In Connection, Austin Group Psychotherapy Society, University of Texas at Austin School of Social Work, Communities in Schools, AIDS Services of Austin, Austin Child Guidance Center, UT Counseling Center, Texas Civil Right Project, La Hacienda, GENAustin Speakers Series, American Group Psychotherapy Association, Seton Hospital, YogaYoga, Breast Cancer Resource Center, and Sundara Yoga. She also provides a free weekly yoga class for cancer survivors. She delights in the way kundalini yoga, psychotherapy, and yoga and talk help people break out of old patterns and find new meaning, hope, and vitality in their lives. Please note that many insurance plans reimburse for out of network services. © 2011-2015 Yoga & Talk®. All text materials copyrighted unless otherwise indicated.